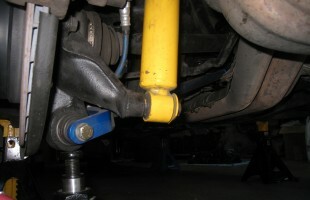 Following my first track day with the M3 Sedan, I placed it back on jack stands for my standard post-track inspection. If anything is going to loosen or break, your best chance of finding it is immediately after a flogging on the track. I should note that during a few slow speed drives around the paddock at TWS, I kept hearing a squeaking sound. It was rev-matched to the rotation of the wheels, so it was either at the wheels/hubs or the rear axles. A quick visual didn’t reveal anything, and eventually the sound subsided. I should be thanking my lucky stars, because the sound was coming from the Torx bolts that fasten the inboard CVs to the differential stubs. Several of them had loosened and backed out enough to rub theCV rubber boot. 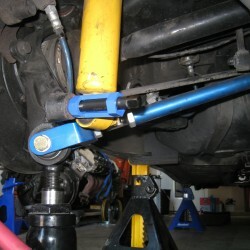 My first clue was a bit of grease flung on the brand new blue anodized Turner lower control arms. Obviously this could have been disastrous had the CV become unfastened completely from the differential, especially at the 130+ mph attained at TWS. I neglected to grab any photos of the issue, so you’ll have to imagine what I’m describing. To make sure they wouldn’t back off again, I used the impact wrench with a very long extension to tighten all the bolts accessed through the wheel well, with the wheel removed obviously. 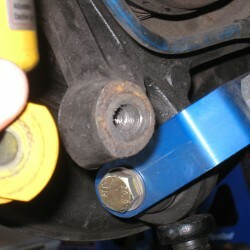 While I was at the rear, I also noticed that the left lower shock mount bolt had loosened. I went to tighten it up with an 18mm ratcheting wrench, only to find it stripped. I had previously discovered some thread damage on the trailing arm, which I thought I had solved by running a tap into the threads. Unfortunately the threads were damaged beyond simple repair, with about 10mm of thread being completely wiped out. 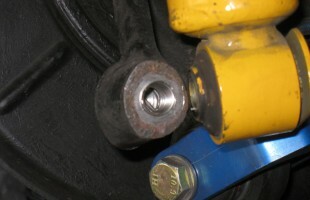 A slightly longer bolt might have been the cheap and easy fix, but at the cost of reduced thread engagement. To properly repair this would require an insert or HeliCoil. I’ve had to make HeliCoil repairs on parts before, such as myMoroso oil pan and the pan mounting holes of my S50. The principle is simple: drill out the old damaged threads, re-tap the hole with an up-sized tap, then thread in the HeliCoil insert which reproduces the original size threads. The inserts are literally coils made of stainless steel. 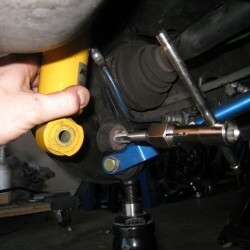 The kits can be found at most auto parts stores or Fastenal, except in the thread pitch which I needed. Fortunately they are available on Amazon or elsewhere online. The complete kit comes with the required tap, inserts, and a tool for threading in the insert. You must provide the appropriately sized drill bit and tap handle. The photos below show the damaged threads and taping the new ones (after drilling out, not shown.) Make sure you cut in a few millimeters at a time, then backing out the tap and cleaning out the hole with some compressed air. Since this is a blind hole, all the metal shavings will just begin to pile up inside otherwise. With the new threads cut, I could now insert the HeliCoil thread restorer. 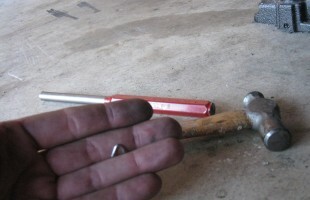 The insert is wound up on the inserting tool, then held against the surface of the hole. Then it is screwed into the hole using a tap handle. This part can be a bit tricky, as you try to engage the insert in the newly cut threads. Fortunately I got lucky and it went in the first time, unlike my multiple trials with the Moroso pan. There is a little tang at the end of the coil that the inserting tool grabs on to rotate it. This tang is notched at the point it bends off from the coils, so that it can be easily snapped off once the coil is fully inserted. I used a simple flat punch and hammer to knock it loose, then some compressed air to blow it out of the hole. The photos below show the HeliCoil inserted with the tang still in place and with the tang punched out and in my hand. And finally some photos of the completed work. The results are restored threads that are just as, if not stronger than the original. 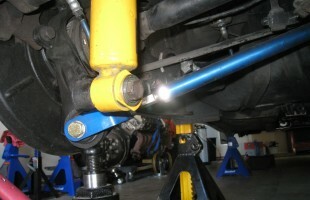 Chad Morehead has an excellent blog on track day driving and tinkering. This is reprinted with his permission.